Mahawu Mountain is a stratovolcano volcano located to the east of the volcano Mount Lokon-Gunung Empung in North Sulawesi, Indonesia. While in the distance, Manado Tua Island and surrounding islands seemed to float on the vast Sulawesi sea. 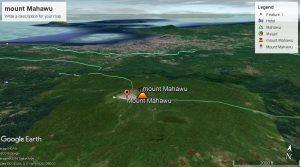 The Minahasa people named Mahawu on this mountain because they often emit ash. In addition to calling it mahawu, this mountain is also called Mount Roemengas. Mahawu Mountain according to the Indonesian Volcano Base Data, before 1789 there were 3 eruptions from the central crater. There is no further information regarding this activity, both the year and the description of its activities. Based on Bouger’s anomaly map and geological reports, 7 modeling cross sections were made to see the crater structure. Of all the models there is a body that is negative (low density) that extends. In the cross section through the crater (5 pieces), under the kawa there is a negative body that is located deeper. Five of the 7 2-dimensional models are arranged in 3-dimensional images (not 3-dimensional models) in order to provide stereometric images, and to control the cross-section of one another.